HomeProtect Landlord rent insurance protects you against the legal costs involved in evicting tenants either for non-payment of rent or following the expiry of the tenancy. 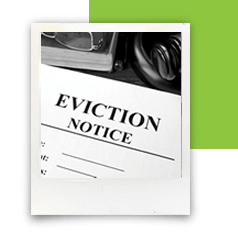 It also covers you for a certain level of rent arrears from your tenant under the terms of their tenancy agreement while you’re pursuing eviction proceedings against them. Check our latest policy booklet for full details of the terms and conditions of Landlord rent guarantee cover. Note that these include the requirement that you have correctly issued Section 8 and Section 21 notices where appropriate. Landlord rent guarantee cover is an upgrade option on your policy – just select it on the ‘Your quote’ page when you get a quote for landlord insurance. There is a discount available on the cost of Landlords rent guarantee cover if you buy it at the same time as our Landlords legal expenses policy upgrade. Just call our 24/7 emergency helpline on 0330 660 0660.